Disclosure: We may receive a commission for links on our blog. You don’t have to use our links, but we’re very appreciative when you do. Thanks again for your support, we hope you find our posts and information helpful! The effects of World War II and the systematic capture and killing of innoccent men, women, and children by German Nazis can be seen across Europe. Historically, Poland was one of the more strongly affected countries and is where two of the larger and more well-known concentration and death camps are located. While we were in Warsaw, we visited areas of the Jewish Ghetto and witnessed memorials and sections of the walls that were built during German Nazi occupation. We also visited Krakow, which is about an hour and a half drive from Auschwitz I and Auschwitz II-Birkenau concentration and death camps. 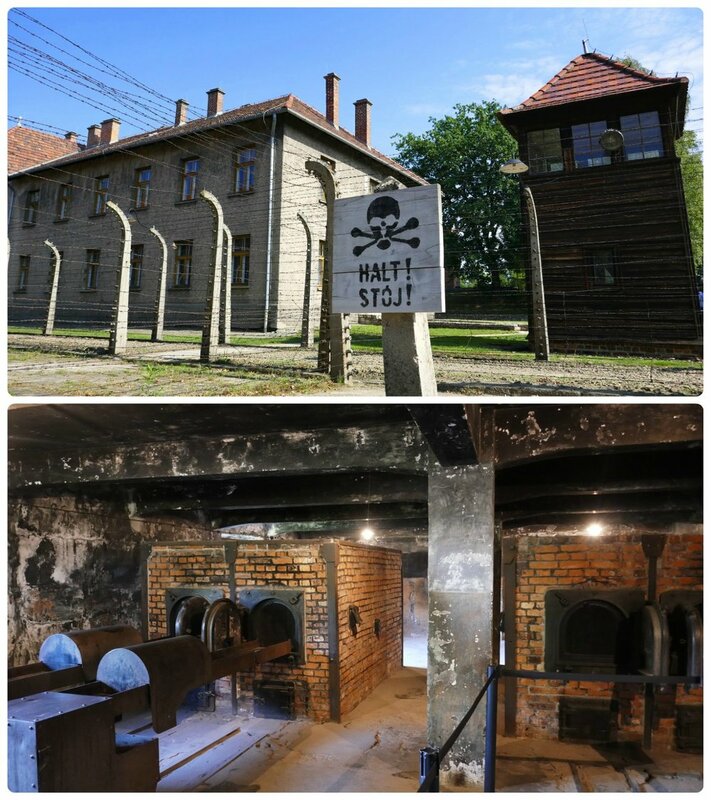 Like many visitors to Krakow, one of our main goals was to visit the two concentration camps. Most visitors to Auschwitz I and Auschwitz II-Birkenau know the history of the two camps, likely from the multitude of books, documentaries, and other educational pieces that have been created. Instead of discussing the history, we’re going to take this opportunity to share our experience at the camps through our pictures, as there are no words that will fully capture the meaning and emotions behind the camps and the atrocities that took place there. You can find general information about the Auschwitz Memorial and Museum by visiting the memorial's website, or for visiting information such as, temporary exhibit closures, guided tours, or opening hours check out the memorial’s visitors section. Standing in front of the entrance to Auschwitz Concentration Camp can be an emotional experience. Be prepared for the infamous entrance gate, rows of barbed wire, watchtowers, and lines of brick buildings. The feeling of terror and death could be felt at the Death Wall, where victims passed through the gate to face their fate of execution in front of the wall. It's asked that all visitors respect the memories of the victims executed at the concentration camp, as well as the other visitors. In particular, when entering the gas chamber (bottom image) silence is requested. Between the watchtowers that surround the camp and the bleak interiors, it's hard to escape the despair that must have once enveloped the camp. The displays in the museum are elegantly presented and informative. On display are the personal belongings of the prisoners, including dishware, glasses, shoes, and suitcases. Clockwise (from the top): The cans that held the pesticide used in the gas chambers, a hallway lined with photos of victims, the restroom facilities available to victims, the outside of Block 14. Tours are a common way to visit the camps, although in our experience there wasn't much more information provided than what could be read on the displays. There's a free shuttle to Auschwitz II-Birkenau, or your tour will make the short drive there. 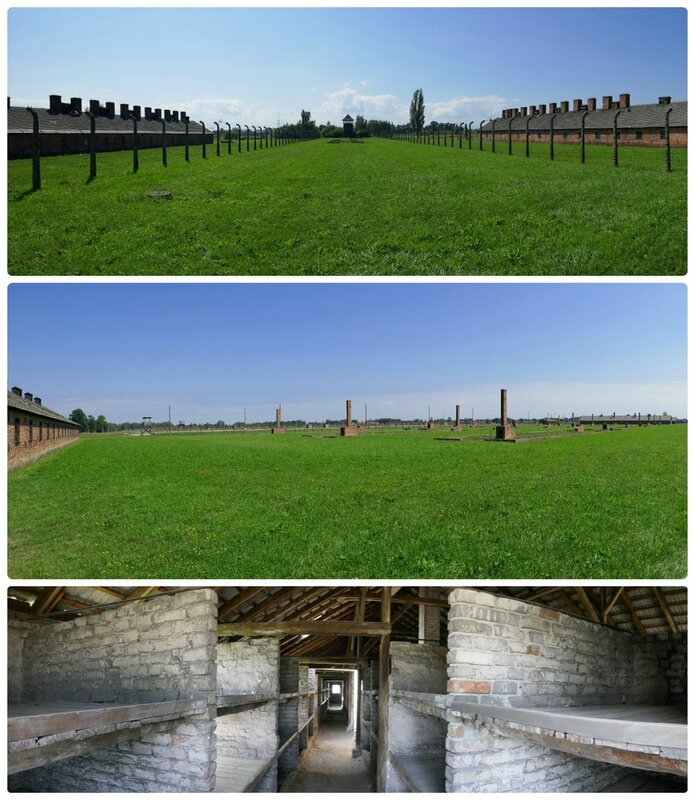 Clockwise (from the top, left): The notorious train tracks that led to the entrance of the camp, the ruins of where the gas chambers used to be, the entrance to one of the most feared parts of the camp - where prisoners knew they were soon going to be killed. The Auschwitz II-Birkenau site is extremely large and many of the buildings are now left in ruins. The living situations were stark and it was difficult to even begin to reflect on how terrible it must have been. Our blog is meant to document our journey of continual long-term travel, becoming digital nomads, and pursuing financially independent/retired early (FIRE). It’s full of ideas, tips and solutions. Join us on our journey, as over time we'll share our challenges, our stories, our goals, and our mistakes. We live our lives with the goal of being better than average. Well, honestly, not just better than average, but within the 90th percentile*. What does this mean? It means when evaluating how we live (resource consumption, our expertise in an area, our travel, our discipline, etc.) we will be better, stronger and higher achieving than at least 90%* of the rest of the world. While not always realistic, we shoot for the stars, because if we don’t make it we’ll at least hit the moon! This stuck with Sergio through his early career and guided him as he made choices and developed his career, life and ambitions. Sergio brought this to our relationship and it stuck with both of us. It has sense merged into the idea of being better than average and being in the 90th percentile*. We challenge you to screw the average; to push yourself to be in the top 10% and leave nothing at the table! *We chose the 90th percentile as a placeholder; this is an arbitrary number and can be anything you choose and that is right for you. Maybe an 80th percentile goal is ideal, or maybe 97th percentile is best. The decision is up to the individual, whatever you pick, don’t let this hold you back! Men's and Women's Lightweight, Minimal, and OneBag Essentials for Long-Term (Digital Nomad) Travel. We’re husband and wife and lucky enough to be best friends. Somehow, we found each other in this chaotic, yet beautiful world and are a perfect match. Our blog is meant to document our journey of continual long-term travel, becoming digital nomads, and pursuing financially independent, retire early (FI/RE).